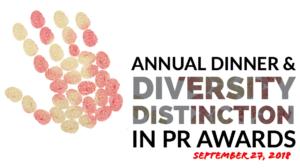 Congrats to all of our winners of the 2018 Diversity Distinction in PR Awards! See below for a complete list of the winners, along with the videos submitted by each. Take a look back at the 2017 dinner here, emceed by Al Roker, host, and weatherman of NBC’s Today Show.